It really doesn’t seem possible but somehow my babies just turned three years old! 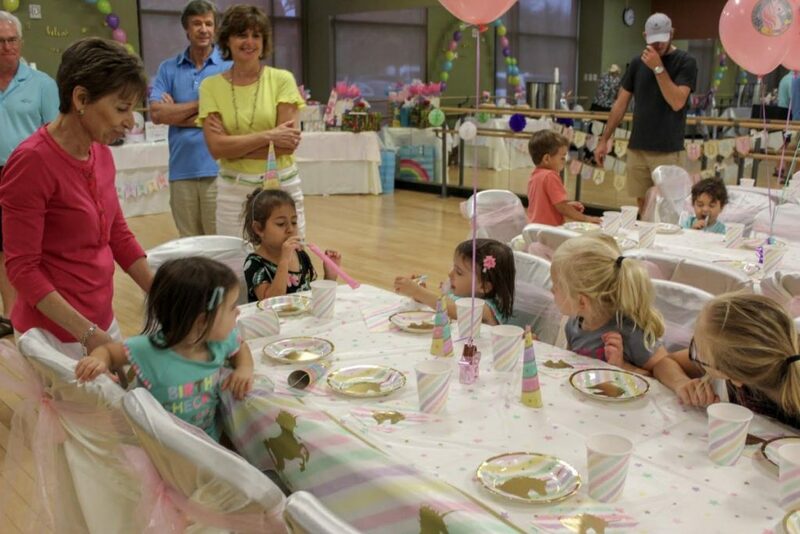 They are just now starting to understand birthdays and parties so I wasn’t too keen on having a really big party that involved at a lot of effort this year since I’m now about 8 and a 1/2 months preggo, and as my husband keeps reminding me they will obviously not remember this when they are older. So, we opted to do a birthday party package through our gym that pretty much included all of the necessities. 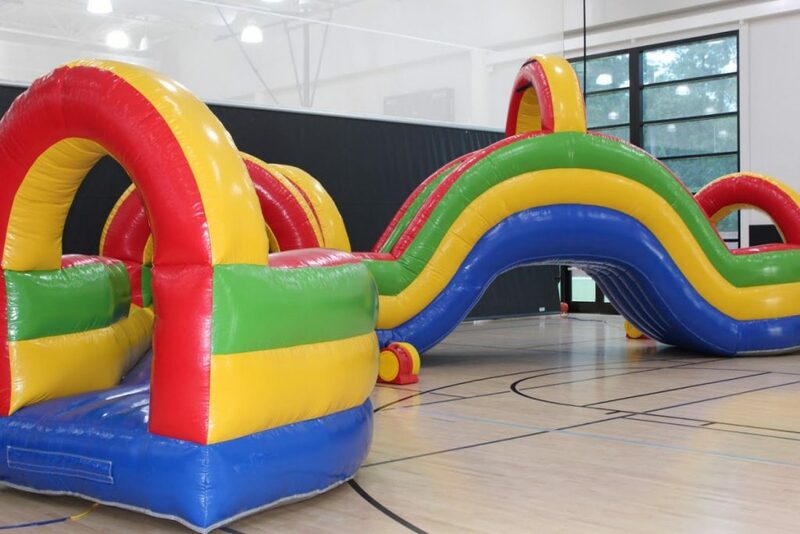 It worked out well because the girls have recently developed an obsession with rainbows and the gym has a giant inflatable they use for parties that looks like a rainbow (see below). 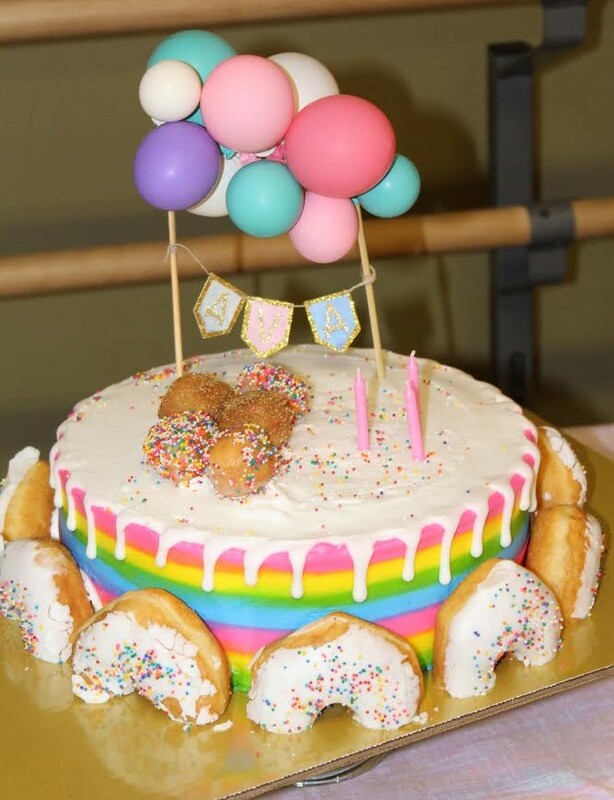 The girls also love unicorns so we decided we had to have a unicorn and rainbow birthday party for them this year. The giant rainbow inflatable definitely kept the kiddos entertained for a while, if you’re hosting your own rainbow/unicorn party check out this smaller size version of the rainbow inflatable bounce house. The gym also opened up their rock climbing wall and passed around a couple of basketballs and some of these old fashioned scooter boards to provide a variety of activities. 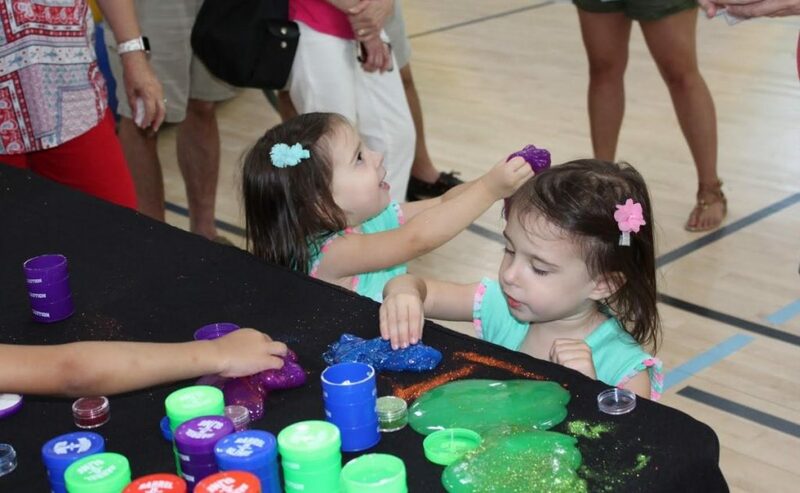 A table with glitter and slime was also provided and it seemed to be a pretty big hit! Find your own glitter slime here for only $10. I don’t recommend letting the kiddos bring this home from a birthday party, accidentally leaving it in a hot car makes for a very slimy mess! My favorite thing about their party this year was all of the pretty, girly decorations. Walking into the party room felt like walking into a nice bridal shower! I loved the way the chairs and tables were decorated. Most of these decorations can be found at Party City. 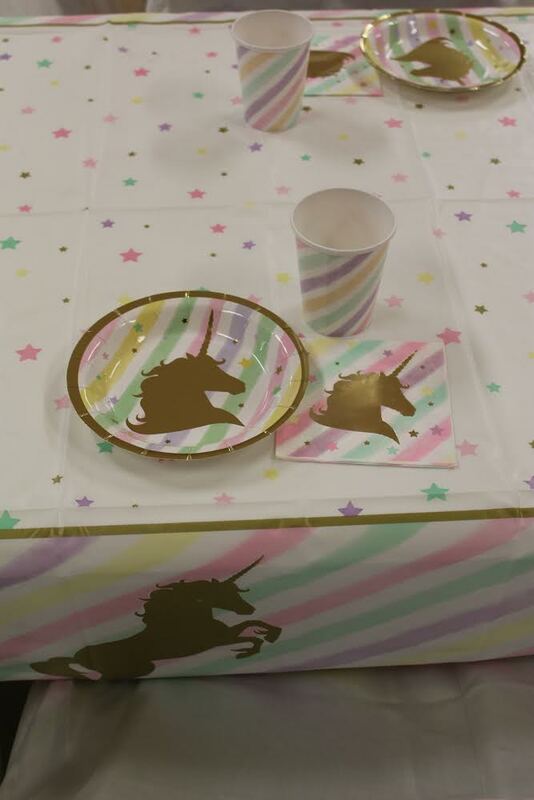 You can find these gold unicorn dessert plates, beverage napkins, pastel rainbow cups and sparkling unicorn table cover all at Party City. OK first of all, how completely adorable are these cake toppers??? So precious! My super talented friend, Chevonn of Celebrate. Every. Day. | Event Decor made these for the cakes and they could not have turned out any cuter! 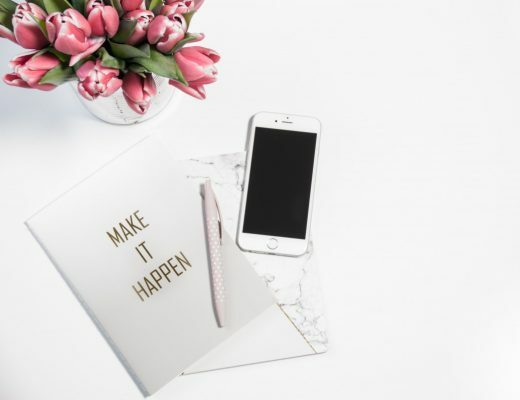 She makes all kinds of custom party decor that is very affordable and ships everywhere, to contact her e-mail chevonn@celebrateeverydayevents.com. HEB’s bakery made the cakes for the party, we had one vanilla cake and one chocolate. 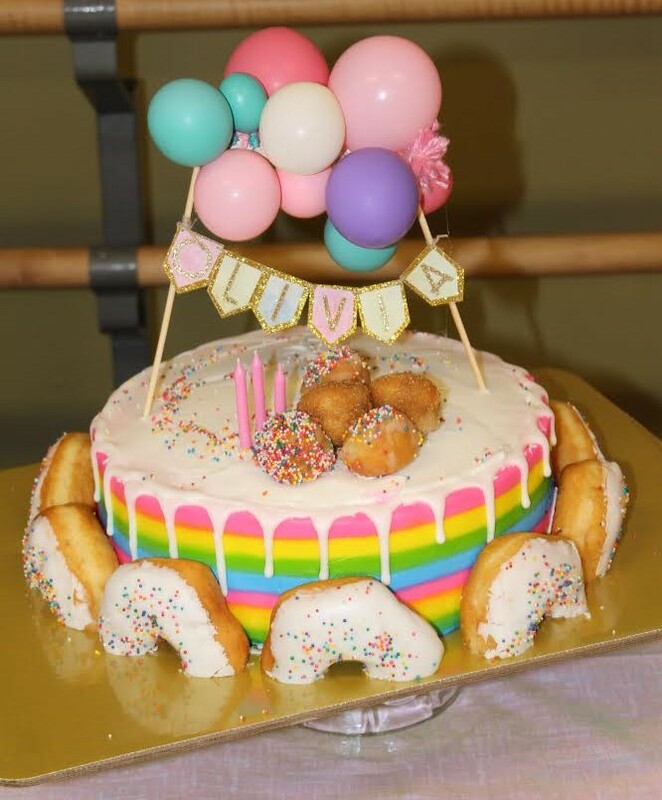 I wasn’t too thrilled about how the rainbow sprinkled donuts looked around the bottom layer but I’m glad we got them because the girls were beyond excited to have both cake and donuts at their party! My girls went nuts over this giant unicorn balloon that I ordered through our HEB. It was super convenient to order because not only did they inflate it for me at the store, they also added tiny weights to the bottom so it would stand upright and not float away. The cost was great, only around $25! This balloon is HUGE and barely fit in the back of a small SUV so if you order it make sure you have enough extra space in your car to transport it. I loved all of the banners for this party, the theme was just so pretty! 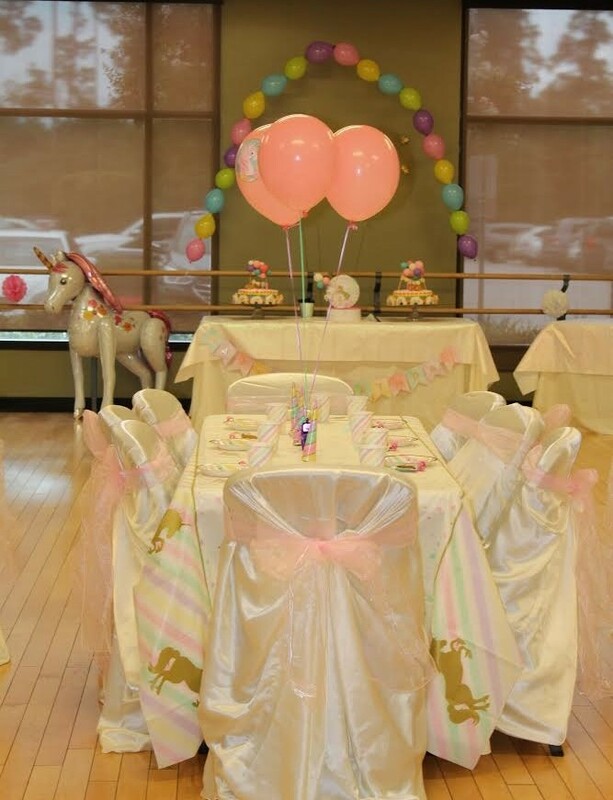 The I Believe in Unicorns Banner above the table was made by Celebrate. Every. Day. 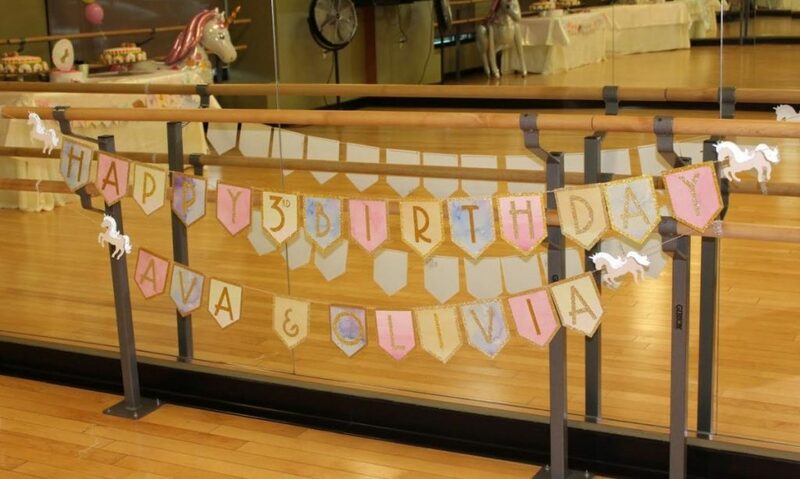 | Event Decor and the unicorn pennant happy birthday banner located at the bottom of the table in the above picture is from Party City. The above gorgeous custom banner was also made by Celebrate. Every. Day. | Event Decor. I absolutely love how the gold letters and trim look with the pastel colors, it turned out so beautifully! Our party room was in a dance studio at the gym so there were mirrors everywhere and not much wall space. 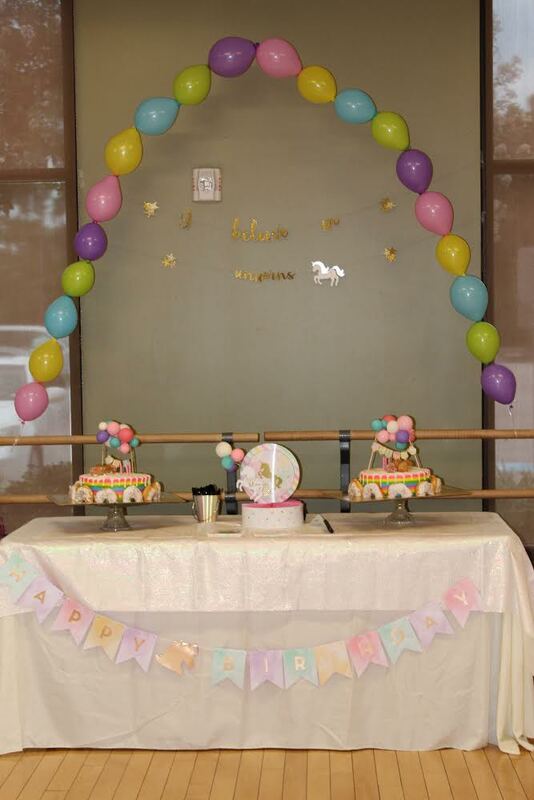 The kiddos seemed to love all of the mirrors for practicing their cartwheels and dance moves while all on a major cake and donut sugar high! At first I was a little hesitant to do the unicorn/rainbow theme since it seems like it’s everywhere these days but there are so many different options and styles for decorations I think it turned out well! I loved the pastel rainbow colors mixed with gold, it was so pretty and very fairy tale like. Most importantly my girls seemed to absolutely love it and have already asked when the next unicorn rainbow party is! For questions or additional information comment below or contact http://makingmemorieswithmyminis.com/contact/. Precious girls. The unicorn party looks fab. The doughnuts probably went fast. Kids love the small size decorated treats. Thank you!!! They were all really excited about the donuts & cake, we also had ice cream too, I probably had parents mad at me for the sugar overload LOL! 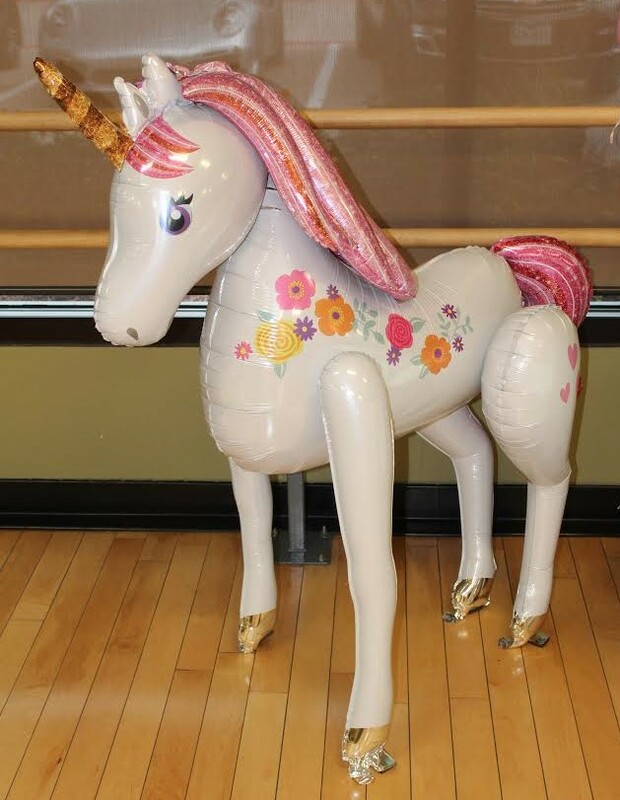 OMG, the unicorn balloon is awesome, I want one! And Happy Birthday for your girl, all the best for her! My oldest niece had a unicorn themed party for her birthday this year, but it was mostly the cake/decorations more than anything else. LOL Love that you were able to have this at your gym and those decorations are gorgeous!! Thank you! I know, the unicorn theme is so popular! Understandably though, it is all just so cute! What a gorgeous party! I love the donuts with the cake!!!! Thank you!!! The girls loved it too!